Driving into the city after hours or on weekends is preferable to waiting half an hour for a train (“I could have been home by now!”). You can’t time when your movie finishes or when friends finish their meal at a city cafe so timing the journey home is often difficult. Good article Daniel once again. The frequency on the Hurstbridge line beyond Eltham is even worse. Interpeak and weekends frequency is 40 mins and it is 60 mins after 7pm! This includes Diamond Creek which is the same distance from the CBD as Mitcham, Spingvale, and Mordialloc, and has 11,734 residents (ABS stat). Your feed must be fixed as I just received multiple posts by you to my rss feed. Having a look at the ATO small business benchmarks (https://www.ato.gov.au/business/small-business-benchmarks/ ), I would expect around 10% profit for a small transport business on 0.5M turnover. They’re getting 3%, so below benchmark, suggesting poor or contrived results. Looking overseas at other operators (admittedly vertically integrated with station real estate and hotel interests), they get 10% profit on turnover. If they were running a computer shop (hard), 3% is ok, but they’re not. I wouldn’t be surprised if they left early or tried renegotiating fees. Their turnover is presumably the fees the government pays them to operate the trains, not the myki revenue . Or is it ? The real question of adequate profitability doesn’t really depend on turnover, it depends on the capital investment that the owner or parent company has ploughed into the business. Since Metro didn’t have to pay for the tracks and trains, their capital investment would be reasonably modest, I don’t know how much. They “ought” to be making at least 10% return after tax profit on the capital which they have invested. More than that ( in this century’s low rate environment ) suggests that their industry is not very competitive or the contract tendering process was not very good. Less than that, suggests that they could have better invested in something else, although they might just not be very efficient. Profit on turnover depends very much on how many time you can turn over a given amount of capital for stock in a year. If your shop has $1m for stock and you buy $1m of stock and sell it all in a month for a 3% profit ( after all other operating expenses ), and then you repeat that every month, then at the end of the year you have got a 36% net profit as a percentage of your working capital, which is pretty good. But if the nature of your shop is such that your stock turns over rather slowly, then 3% of turnover profit is only 3% on working capital, which is pretty poor. You’d be almost better off leaving your capital in the bank. On the other hand, metro is not a shop. The important thing to look at the philosophy of setting service levels. In Sydney, they have set a base service level across much of the rail network – 15 minutes for much of the day (6am-11pm+, every day), with express service patterns running for basically most of the day as well (usually 6am-11pm too). Of course some small stations or branches do not receive that level of service, but the bulk of the network is well served. 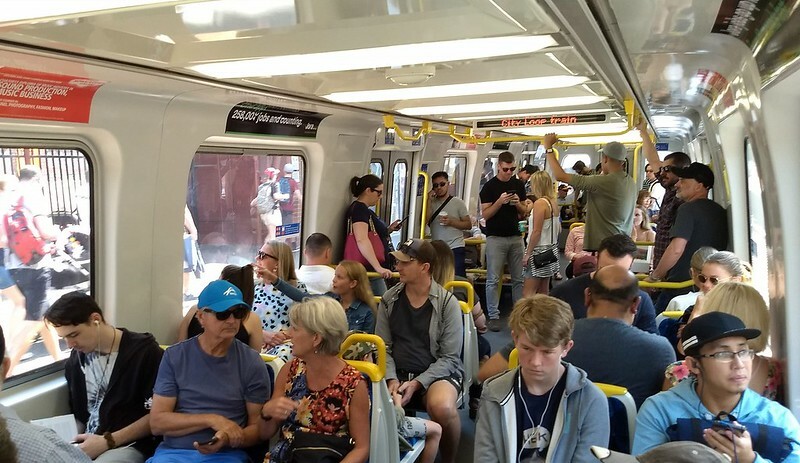 At peak, the network is completely saturated, trains run every 3 minutes in each of the City Circle directions, similar through to Bondi Jn, and on the Main Western Line – which effectively maxes out the entire network. Some difficult and controversial decisions had to be made to achieve this, but has been done in such a way so as to maximise the level of service across the network. In Melbourne, the bare minimum service is provided – some lines were lucky enough, whether through substantial need, politics or history to have had a 10-15 minute service provided during specific periods of specific days. Evening services remain dire, and overcrowded to boot. There has been no attempt to raise the level of service to a good, consistent base where possible across the network. Indeed much of the network is served like Auckland (a city less than a third the size of Melbourne), rather than Sydney or anything remotely close to Melbourne’s size. Peak service is similar, for many lines the lowest possible level of service without many trains literally being unable to take any additional passengers. Some lines have historically lower growth, so the service level determined years or decades ago is left as is. Even where capacity is available, or trade-offs could be made, the very minimum level of additional service is provided so that trains remain at a ‘dire’ state, rather than ‘crisis’. It just shows the government isn’t interested. And that is a much harder problem to solve than fleet allocation or hiring and training additional drivers.